College Board and ACT finally released a joint concordance for the SAT and ACT in the summer of 2018. The latest information can be found on our new Conversion and Concordance post. A detailed FAQ on what it all means for PSAT, SAT, and ACT Takers is also available. How can PSAT scores help students determine whether the SAT or ACT should be favored? The PSAT has long been thought of as a gateway to the SAT, but it can be just as useful in helping students decide whether to go with the ACT instead. Many students have already taken a practice ACT or an official PreACT that establishes a testing baseline. With PSAT scores now available, it’s smart to compare scores to see if there is any clear advantage. Students who have not yet taken an ACT can invest the 3 to 4 hours required to take a practice ACT at a Compass location or from home via our online proctoring. For students unwilling to wait until December to receive their PSAT scores, a practice SAT with Compass is also an option. An added benefit is the far more detailed insights provided by our score reports versus the one received from College Board or ACT. Compass has analyzed available research and concordances to create a comparison tool in both chart and table forms. Although most students will find their PSAT and ACT scores intersect somewhere in the “Judgment Call” band, others will discover that one test or the other is a better fit. It is important to think about the relationship between PSAT and ACT scores as a range of options rather than as an all or nothing proposition. Concordance tables are used by colleges to compare SAT and ACT scores, so the tables are extremely useful to students when choosing which scores to send to colleges. Deciding which score is “higher,” though, is different than deciding which test will be better for you in the future. A PSAT or an initial ACT score is only a starting point. Most students will continue to build subject and testing skills. Students in the “judgment call” zone should think through the testing process before making a commitment. Which test dates will be targeted? Are there test areas or characteristics that make one exam more appealing than the other? What are the test preparation options for each exam? How do Subject Tests or National Merit fit into the mix? Adam Ingersoll has written an excellent post on choosing between the SAT and ACT that outlines some of the factors students may want to consider. Compass directors are experienced in helping make those decisions. Parents and students wanting a more in-depth discussion of some of the issues surrounding PSAT and ACT comparisons may find the questions and answers below of use. How do concordances work for the PSAT, SAT, and ACT, and can they be trusted? In order to understand how PSAT scores are compared to ACT scores, it is important to first understand how SAT and ACT scores are compared. While the ACT and SAT cover some of the same topics, they are very different exams. One cannot take a given score on the SAT and say that it equals a certain score on the ACT. Instead, the tests have a looser linkage known as a concordance. In a proper concordance study, the results from real students who took both exams are compared via what’s known as equipercentile linking. Since the same students take both exams, percentile scores can be directly compared. A 90th percentile score on the SAT can thus be compared to a 90th percentile score on the ACT. The current concordance was built based on a pilot study by College Board, and its accuracy has been disputed by ACT. A new concordance — a joint effort between ACT and College Board — will be completed in spring 2018. PSAT scores are placed on the same scale as SAT scores. The idea is that a 650 on the PSAT represents the same achievement as a 650 on the SAT. To the extent that PSAT and SAT scores can be used interchangeably, they can also share a concordance. Why do no PSAT scores favor the SAT when compared to the highest ACT scores? The PSAT is a test designed for sophomores and fall juniors. The material is slightly easier than that of the SAT, so the top SAT scores are not achievable on the PSAT — even with a perfect answer sheet. The PSAT score range extends from 160-760 (320-1520 total) versus the SAT’s score range of 200-800 (400-1600 total). In much the same way that no PSAT score can represent the same performance as a 1600 on the SAT, no PSAT score can be concordant with a 36 on the ACT (and a student with a 36 should stick with the ACT!). In fact, there are no scores on the PSAT that definitively favor the SAT over ACT at ACT scores of 34 and higher. A high scoring PSAT student with a 34 or a 35 may want to consider both tests, but the PSAT does not represent a difficult enough exam to make a definitive judgment. To give an exaggerated analogy, the PSAT is the golfing equivalent of a par 3 course — not challenging enough to measure the most elite testers/players. A full SAT might be recommended in those judgment call cases. Are these comparisons valid for sophomores as well as juniors? While the relationship between PSAT scores and ACT scores should be consistent, students are advised to be more guarded about making definitive decisions based on the sophomore PSAT. Most students hold off on preparation for the SAT or ACT until at least the summer before junior year — almost a full academic year after the sophomore PSAT — and students’ skill-sets can develop quickly in that period. Ideally, test comparisons are made on exams taken in the same timeframe. It’s a good idea to avoid, for example, comparing an October PSAT score with a practice ACT score obtained in June of the following year. At minimum, the time difference should be a consideration when weighing performance. Of course! It’s meant to be shared. The confusing thing is that PSAT 8/9 scores are already stated on the same scale as the SAT. However, they indicate current performance rather than projected performance. Because of the significant progress — although at varying rates — 8th and 9th graders will make before taking the SAT and ACT, we have not tried use PSAT 8/9 scores to predict ACT scores. We feel that the results would be too speculative. Given that one is meant to predict the other…How do PSAT and SAT scores compare? I don’t understand how a 1500 on PSAT can be equivalent to 1500 on SAT. The former seems to result in a score in the higher percentiles than does the latter. Can you please explain? Percentiles are dependent on the group taking the test. Since fall juniors are a younger group than SAT takers (and have a different composition, since not all PSAT takers take the SAT and vice versa), they have lower scores than SAT takers. This means that an equivalent score ranks you higher among PSAT peers. I’m visiting for the first time so may be missing something–but I think I see a problem in one of your replies. Hannah asked (12/12/2016) about comparing a 1500 on the PSAT with a 1500 on the SAT. She wondered why the PSAT 1500 was stronger Percentile-wise. You replied with info about fall-juniors and other cohort info. But you left out the most important distinction, which is that a PSAT-1500 (on the 1520 scale) is a significantly stronger performance than an SAT-1500 (on the 1600 scale). The vertical scaling used by the College Board is structured so that a score represents — in theory — comparable performance across any of the exams in the “suite of assessments.” A 1200 on the PSAT should be comparable to a 1200 on the SAT. The lower top score on the PSAT simply reflects somewhat easier material. I agree with you that this theoretical structure probably breaks down as scores reach the very edge of the range. Do you anticipate needing/making a new chart for the 2017 score release, now that there is another year’s worth of data on the redesigned tests? Or have the numbers not changed much since last year? 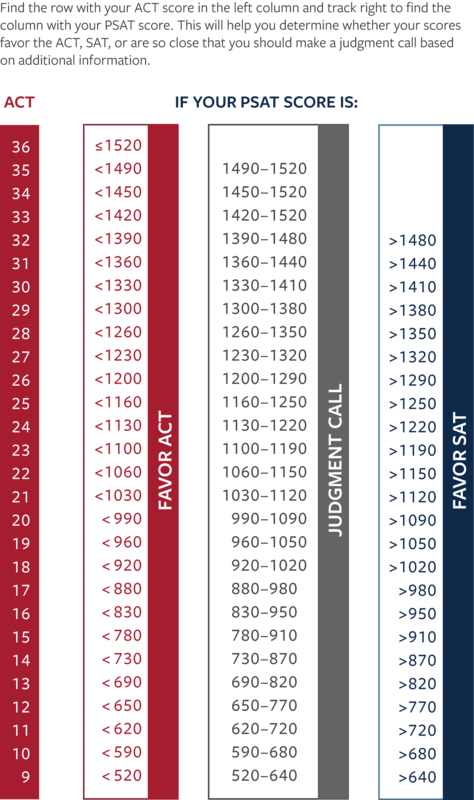 The chart is based on the College Board’s concordance of P/SAT and ACT scores. It has not yet updated the concordance, as it requires extensive cooperation with ACT. They plan on publishing new numbers in the spring of 2018. Short answer: the current chart applies. When comparing PSAT and SAT results, do you compare the scores or percentiles? For example, use 2017 PSAT results of 1300 total score (97th user percentile), 720 Evidence-based reading/writing (99+ user percentile) and 580 math (89th user percentile). If you do a straight score comparison to SAT results, the percentiles drop to 87th percentile total, 97th percentile evidence-based reading/writing and 70th percentile math. Or do you compare the percentiles and convert the total SAT score to 1400, evidence-based reading/writing to 760, and math to 630? The literature says you likely would have scored the same on the SAT as the PSAT, but how can it be accurate if your percentile would vary so much? A 10 percentile drop on the total percentile and almost 20 percentile drop on math seems impossible. The PSAT and SAT scales are aligned so that, in theory, if your student (or you?) was accidentally given an SAT in October, the score would have been around the same 720/580 (at least if you averaged lots of students in the same boat). When you move over to the SAT column, you are comparing fall juniors to (primarily) spring juniors and fall seniors with added academic development, added prep, and added test savvy. That’s why the percentiles are lower. The 1400 SAT (comparing percentiles) basically says that students with 1300 PSAT’s go up about 100 points (not automatically, of course). I want to be careful about how I describe this, because the scores are not meant to be predictions. Percentile equivalents is more accurate. For example, a 1470 is in the top 1/4 of one percent among sophomores. The top 1/4 of one percent of all SAT takers is about 1560. That does not mean that a 1470 student will move to 1560 (the higher a student’s score, the more she “fights” against regression to the mean). In order to maintain her place in line, she must get to 1560. I believe that the PSAT score report also gives predicted score ranges. Do you have a chart like this for the SAT vs ACT? My daughter is a sophomore and took a mock ACT and mock SAT two weeks apart and we are trying to determine which one she favors. Yes, we do. The two charts should be virtually identical, as the PSAT and SAT are on the same scale (the difference being that SAT scores extend to 1600, whereas the PSAT tops out at 1520). I have a converse question for you. If I took the new SAT as a sophomore and scored a 1500 (710 EBRW and 790 Math), what equivalent PSAT score should I expect to get when I take it in the Fall? There is no published data on sophomore SAT to junior PSAT. One problem that you will run into on the PSAT is that your Math score will max out at 760. Unless you increase your EBRW, you would be at 1470. I got 1590 on the New SAT in August 2018. I am junior right now. What will I get in the PSAT if i take it this year? Do I have a chance to make it in the NMSQT. Thanks for the help. I LOVE YOU. Congratulations on the 1590. If you are scoring that high, much of it will come down to luck and where you live. Because the PSAT scale only goes to 760, missing even a couple problems in each section can pull down a student’s score. Your SAT score is actually higher than the maximum possible PSAT score. I expect that you will do quite well. I got an 1180 on the PSAT as a sophomore in August. Is that ok? That puts you in the top 10% of sophomore PSAT takers! If I made 1070 on the PSAT should I favor the ACT more than the SAT? I would recommend that you take a practice ACT for comparison. ACT has a downloadable test on its site. Try to have a family member “proctor” the exam and keep you completely honest on timing and breaks. That should give you a good idea of how the tests stack up. Hello, I am a junior and I scored a 1300 on my psat which I recently got back. To what sat score would this might translate, and would you recommend taking the sat or the act. Thanks! Congrats on the 1300! The idea behind the PSAT’s scoring is that it aligns with the SAT – so if you were to take the SAT today, you would expect to get about a 1300. That concords to a 28 on the ACT. The only way to know whether you should take the SAT or ACT is to take a practice ACT test! If you score less than a 26, you should probably prep for the SAT; if you score higher than a 30, you should probably prep for the ACT. If you fall somewhere in between, you may want to consider other factors, like test dates and personal preference, before you decide which test to take. I must clearly be missing something because I am still confused 🙂 My son got a 1230 on the PSAT and I can’t figure out if he favors the ACT or SAT or if it is a judgement call? In order to know whether your sun favors the ACT or SAT, he’d need to take a practice ACT as well. Then you can use these features to compare scores and decide where he falls. Visit compassprep.com/practice-tests for options. I attended a meeting on the PSAT test that was given Oct 24th. Apparently because of some anomaly the test was easier so the College Board decided to grade it “more harshly.” That being said my daughter scored a 1370. She only missed 6 questions on the entire test. But it looks like she won’t be in the running as a National Merit Semifinalists. Also her ACT score came today & she scored 33. Will that score be considered as well? And should she take the SAT? She is a Junior this year. Yes, the 10/24 PSAT was horrendous. The Selection Index is used rather than the total score (1370), but it’s likely that your daughter will fall short for NMSF. Only the PSAT applies at that stage. She need not take the SAT unless she thinks it will give better results than the ACT. It sounds like she is already on the right path. My son took the PSAT 8/9 one month into 8th grade (9/26/17) and scored 1300 (680 math/620 reading/writing). He just took the 8/9 again as a freshman. Other than looking at the type of questions he got wrong back in 8th grade, we weren’t too sure what else to do to help him prep. Are there any recommendations for helping a student improve when the margins are so thin? What would be a reasonable expectation for improvement for the PSAT/NMSQT? That 1300 puts him at 99+ percentile as an 8th grader. On average, scores improve by 30-40 points per year on each side of the test. Most of the prep applicable to the SAT is applicable in your son’s case. There are more self-prep options than I can list in a paragraph, and I don’t like to play favorites. Khan Academy is one of the most convenient options, and some of their materials are based on released exams, which is always a plus. Your son is on the young side for paid prep. Hitting one’s peak in the 10th grade isn’t of any benefit, so most students wait until the summer after sophomore year to take a class or do tutoring. If your son stays on track, he should be able to achieve a score in the high 1400s or better.